Mano a Mano Eco Hostal, Las Penitas, Nikaragua : Rezerwuj teraz! Mano a Mano is an amazing hostel made out of wood in the chill community of Las Peñitas. 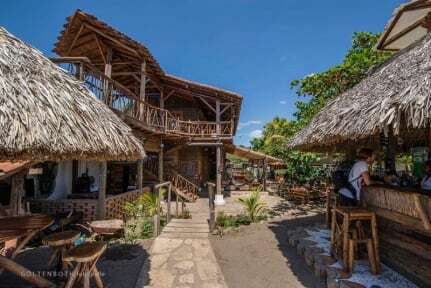 It is the dream hostel made out of recycled and organic materials with amazing beach views in front of the wave paradise of Las Peñitas, Leon, Nicaragua. We offer 4 dorms, 2 for 8 people, 1 for 5 people (with private bathroom) and 1 for 4 people. All beds come with individual fans, mosquito nets, lockers with plugs to charge your devices. In addition we have open kitchen and a fridge, hammocks to chill after surfing and an onsite bar to enjoy great cocktails. Upstairs we offer loft style mezzanines suites so you can enjoy the sunset, with a sofa bed, private bathrooms, and a locker. Beds are made from bamboo with mosquito nets and a fan.